Characters are the first point of contact between the audience and our story. But how do we convince others to become invested in them? How do we imbue them with a believability and life of their own? Well, first you've gotta get to know them. Character depth is a phrase that is thrown around a lot in stories. At its core it means that the character feels believable in some way or another. Beginners often think that to achieve this, you have to weave a deep and intricate back story. However, this is not true! In my opinion, it's more the practice of putting a piece of yourself into your characters that gives them the spark of life. By this, I don't mean make them just like you, more that finding common ground will help you relate to them and write from a truthful place. There are a lot of different ways you can get to know your characters - get ready for a list of our favourites, using this week's project work as examples. The start of this journey begins with a whole heap tonne of sketches. Spending time with your characters will help you get to know them - the way they hold their body, the expressions they are most likely to pull. A good tip is to keep thinking in specifics. You're not just drawing a girl laughing, you're drawing this girl laughing. How would she smile? What is her body language when she feels insecure? How does it differ from others? You can see in the Girl and the Glim sketches above (Heather top, Niles bottom), I haven't JUST drawn the characters. There's still so much more to explore with these guys -- but even with these preliminary sheets, I've started to design associated objects and locations. If a character has a camera, use reference! Decide how expensive a camera it would be, how new, how well looked after, what colour! All of these choices tell us something about the character who owns it. Niles' camera is newer than Midge's (pictured below), which is a hand-me-down vintage model from her brother. It's also in better condition, as Niles is a pretty neat and organised kid. Midge's camera is a bit more battered, even though Midge is almost too reverent of it to take it outside. Her brother covets his things, but they tend to become buried in his closet and get their fair share of scratches. Another thing I love to draw and find particularly useful when getting to know my characters is their bedroom. I have done on both Heather and Niles' sheets. I'm still trying to find something that clicks with me for Heather, but I like the direction that Nile's room is heading in. You can see Niles' passion for photography reflected in his surroundings. Pictures he has taken flood his photo wall, next to the litter bin when he throws the pictures he is no longer satisfied with once he tacks new ones up. Piles of Albums (all labelled) are stacked around. He had to take the bottom shelf of his bookcase out to fit them a bit better. He has some inspirational photos from his favourite photographers framed over his bed and some more personal photos of friends by the side of his bed. His certificate for winning a contest, his proudest moment, is also up on the wall, by the step ladder he uses when sticking up pictures or reaching on top of the bookcase. He takes care of his plants and succulents, which make his environment feel brighter. Niles has also used red translucent plastic to create his own bedside red light, which he has used in several failed photography experiments. As you can probably tell, I learn SO MUCH about the characters by doing these! I didn't know any of this stuff before I designed Niles' room. Here, you can see some sketches of Midge, Sylvia and Jove's rooms from early last year, when I was just starting to probe deeper into their characters. If you're having trouble figuring out who your characters are, a good technique is thinking up a scenario to confront them with and then seeing how they react. Alex Hirsch, creator of Gravity Falls famously pitched the show by depicting the different ways in which the characters would react to finding a dollar on the floor. Dipper would start thinking up conspiracy theories, whereas Mabel would be more likely to keep it as a pet. If you have a hard time with this, try depicting several different ways in which your character could react, seeing what feels the most 'true'. Then you can actively compare the drawings to see what DOES work, and there's a heap ton of guidance there showing you what DOESN'T (or at least which ones are weakest). 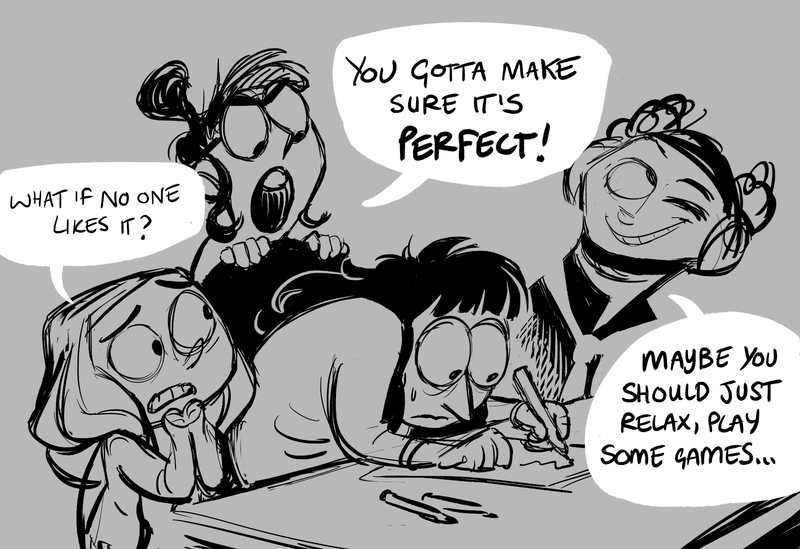 If you're still looking for fun ways to explore scenarios, try drawing your characters interacting with one another. Characters act differently depending on who they are around, so this can be a great way to draw out hidden aspects of your character. Do they know the other character well? Are they comfortable with one another or uncomfortable? How do they feel about someone of that age/gender/profession? Humans are multidimensional beings. You would be hard pressed to meet a person who is just a coward, or nothing but brave. One thing I've found common in the most beloved characters is an element of contrast. Robin Hood is a kind hearted thief, Wily Coyote is dangerous but bumbling, Batman is a dark savior for Gotham. To find these contrasts in your own characters, I find this exercise I learned from The Oately Academy super useful. I used it when creating Midge, the protagonist of The Girl and the Glim. First, make a list of words that come to mind when you think of your character. Then, write a second list of words where you just list the opposite words to the ones already listed. Once you have the new list, you can go through it choose one or two descriptors to apply to your character that you feel you can run with, and create some interesting situations from. With Midge, as she is very quiet and shy usually, I decided that when she finds something really funny, she can't suppress full blown and loud laughter - to the shock of anyone around her. We spoke a few updates ago about your story's theme, and how to use your characters to embody that theme. However, characters should be more than puppets / concepts or vehicles that are piloted by your story. Who are they, what do they enjoy? If your story becomes their path, what would it be like if they were to stray from it? How would they spend their day? How would they react to a sudden unfamiliar environment? Asking questions about them that you don't have an immediate answer to will help you to dig deeper into WHO your character is, and what they will become through the experiences you guide them through. I mentioned this in the introduction. Though I think it's one of the most important aspects of developing your characters, it's something I feel like I only discovered on The Girl and the Glim. You can't write a story while holding it at arm's length, and the same goes for writing characters. To create a character that rings true, a personal connection to that character is required. How can you truthfully write from a perspective you do not in some way understand? Midge, Sylvia and Jove are all very different characters, and yet they are all aspects of myself. A picture paints a thousand words, and I think this will explain it better! I know these characters extremely well because I interact with them all day every day. They are the parts of myself that are constantly at war as I do my work. Your connection doesn't have to be so explicit, though. It could be that someone you know shares traits with your character, or that you have experience with a similar situation to one your character is dealing with. Mike and I have had some very deep groundbreaking discussions this week involving his Raven King characters and how they relate to his life and his experiences. Find that personal angle. This connection will help you more than anything else in understanding your character, and yourself. Claire Keane spoke about similar strategies in her approach to crafting Rapunzel in this Interview (we set the link to play from the appropriate timecode). She talks about the times she would sit alone at home, imagining how Rapunzel would spend her day to day. Living and breathing, and walking in their footsteps will help spark life into them as individuals. We hope you find these battle strategies useful. Discussing them over the past couple of days has given Mike some interesting revelations about his own characters. Writing what you know or what you've experienced first hand personally can help you understand why you're telling your story. What sparked you off in the first place? I realised recently (today!) that the story of Raven King is a creative reaction to the events of my own life, and it's giving a voice to and an outlet for an emotional resolution that has been otherwise missing. There's a catharsis experienced by giving voices to the facets of ourselves that we'd not proud of, or suppress. I found some older sketches from when I was studying Ravens and really early concepts for Robin. If the theme of the story is about letting go, can the process of telling the story itself also be a means of letting go? Letting go of whatever drove it in the first place for the artist? It's really scary to realise how deeply personal a story's roots stretch, and even with the abstraction of a change in setting, character and circumstance, those emotional fragments are still scattered throughout. I think I've been struggling with telling the story of Raven King because I was trying to navigate around those painful moments, or pick them out and place them to one side in order to make the story feel safer, and avoid the risk of opening up too much. Sharing a story like this requires vulnerability - but that is what we hope the readers will connect with. That's where the heart is. Robin's father always felt very cold and distant. He was a little bit of a cookie cut gruff father type. When I came to realise he would be coiled around his pain / grief, his expression softened and his shoulders dropped. This was a man weathering an internal storm - and that needed to read through every aspect of him. Spending time this week drawing gestures and ideas of the characters is something fairly new to me, and Swifty has been totally inspiring me with her work on Witch of the West and Girl and the Glim. I don't usually work in line so it's been a learning curve to draw digitally again since I plan to pencil the comic in photoshop. I'm less concerned with clothing design here and more in tune with the way the character chooses to move or pose themselves. Robin is going to be fairly physical and active throughout the story, which will push my understanding of weight / line of action and gesture. I'm going to keep drawing and spending time with these characters so I can begin to wear them like second skins. You've got to let the madness out somehow. 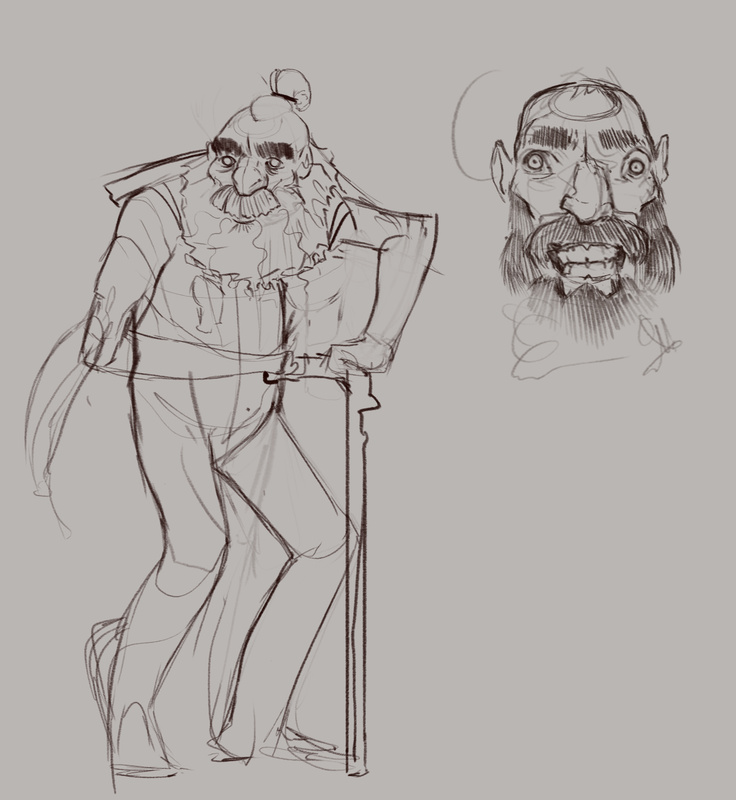 Speaking of character design, I've made some nice progress on the main villain for The Witch of the West five page pitch! I had a whole lot of help with this guy from the awesome people who joined us in the chat on Wednesday's Evening Stream - if you want to see how the design unfolded from start to finish, you can watch it here. He's a necromancer bandit, and the slimiest, smartest card shark you ever did see. After getting caught stealing red handed, his hands were removed as punishment - though they didn't stay that way for long. Thanks to his Necromantic Black Magic, they rose again as ghostly spirit hands. Unfortunately for the Law, they may be even better at stealing than they were before! Please let us know if you'd like a post dedicated to external character design rather than internal design. I have a presentation that I could share with you varmints if that's something you would be interested in! We'll be showing some finished thumbs for the comic pages, which is scary and exciting in almost equal measure. We'll also be showing how we use spreadsheets to track our progress page by page. Catch you next time!